At 8:05 a.m. the National Weather Service in Tallahassee declared: “Snow has reached Tallahassee." Snow in Tallahassee on Wednesday was the first significant frozen precipitation in nearly 30 years. Florida's capital woke up to snow and sleet on Wednesday, the first significant accumulation of frozen precipitation since 1989. At 8:05 a.m. the National Weather Service in Tallahassee declared: "Snow has reached Tallahassee. Precip will end quickly from the west over the next 30-60 minutes." Sure enough, after about 10 minutes of puffy flakes, the sleet and flurries melted quickly as Tallahassee's morning traffic was significantly lighter due to weather warnings and school closings. Streets remained icy as police and transportation officials closed roads and urged caution. Hazardous conditions caused an early morning accident forcing the closure of an I-10 flyover at Thomasville Road and U.S. 90. State highway officials also closed parts of Interstate 10, between Capital Circle Southwest to Live Oak in Suwanee County due to ice on the roadway. The forecast of a winter storm prompted officials to close schools, including Florida State University and Florida A&M University. The last time a wintery blast hit Tallahassee with any measurable snowfall was Dec. 22-23, 1989, when an inch fell. 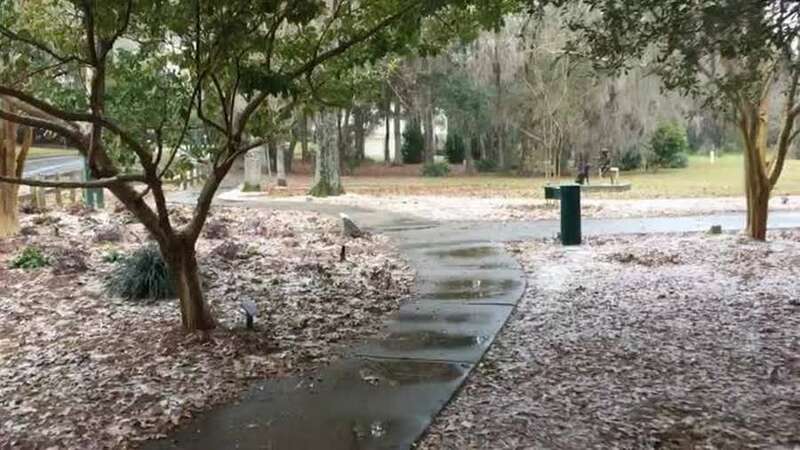 This time, the snow accumulation was more significant further north in Georgia where homeowners reported a half-inch of snow in Valdosta.